Does your school’s athletic teams need new logo folding chairs for this year’s athletic events? Your team can have customized logo folding chairs, stools, and slip covers at Athletic Seating. We have been the first choice of High Schools, College and Universities, and Pro Teams for over 20 years. 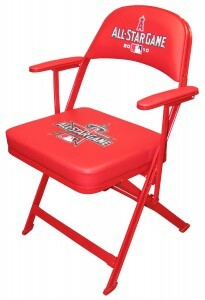 We feature portable seating by Clarin, with your team’s name, mascot, and/or sponsor custom printed on the chairs. All products we sell are made in the U.S.A….not overseas. And since we’ve been doing this for over 20 years, our experience and knowledge will not only ensure that your product looks the best, but Athletic Seating will save you money. We sell the full line of Clarin Seating products for less than other dealers…..in some cases, up to 50% less! Get a quote from another dealer, then give us a call…you’ll see for yourself. Not only can we offer deep discounts on folding chairs, stools and slip covers, but unlike other dealers, your logo chairs are printed in house. With an exclusive process that makes your teams logo and colors “jump” off the chair. We offer free proofs with your inquiry to us about seating products also.